My friend Dana and I have only known each other for about a year and a half, but right away it was clear we were meant to be lifelong friends. Early on, we discovered that we both share a passion for good food, wine, traveling the world and the occasional late-night Taco Bell run. It was a friendship match made in heaven. So as we were sitting on her couch in December (drinking wine, obvi), I asked what her travel plans were for 2015. 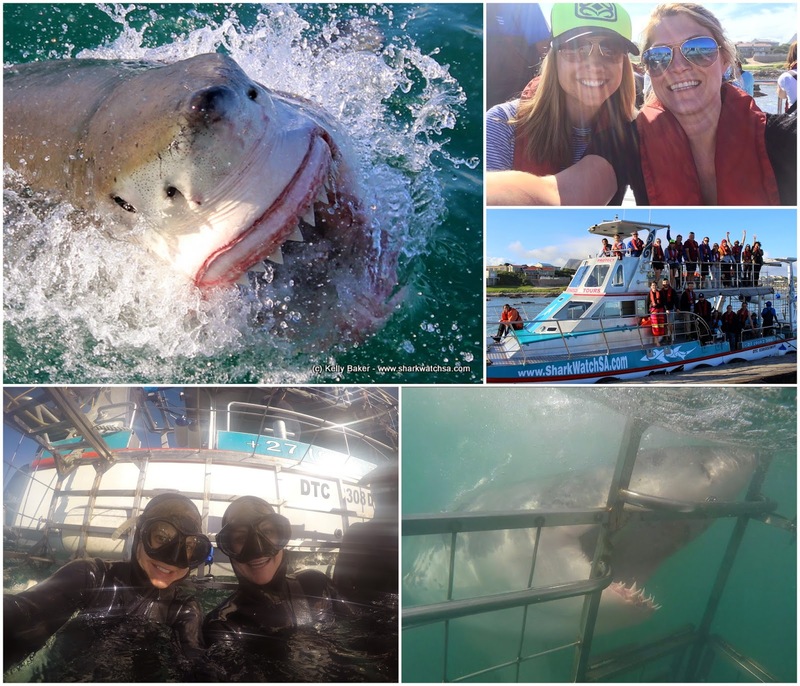 She said she wasn't sure, that she really wanted to go to South Africa and dive with Great White Sharks, but added that no one would go with her. To which I immediately replied (/slash yelled): "Uhhhh.... I'll go! As long as we can go on safari." And with that, our South African adventure was born. We both had a desire to spend considerable time in Cape Town, and made that our home base for six days. Many tourists opt to stay in Camps Bay by the ocean, but we were having none of that. Instead, we settled on a perfect Air BnB flat in the city center with a killer view of Table Mountain and close proximity to everything (namely, the bars on Long & Bree Streets). *At the time, it was about $105 per night, but I believe it's gone up a bit in price since. Speaking of which, we wasted no time "adapting" to our new surroundings. After 19 hours of traveling (JFK direct to Johannesburg on South African Airways and a quick flight to Cape Town), we arrived around 1pm local time. We unpacked, relaxed by the pool, and then got ready for dinner and drinks. We were thrilled to learn that South Africa recently launched Uber, and used that almost exclusively to get around. The base rate is 8 rand... which is approximately .67 cents in U.S. dollars. Sooooo basically, most rides within the city were free. (Or at least it felt that way). 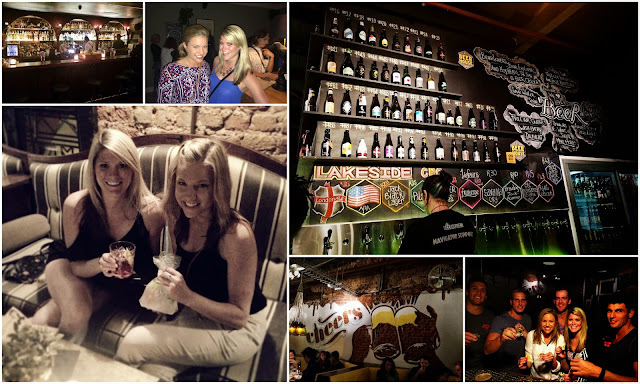 Our first stop on Long Street was Beerhouse, which literally has 99 bottles of beer on the wall to choose from, along with a long list of South African beers on tap (which will often run you less than $2!) It was very lively for a Thursday night, and we quickly made friends with some locals. In no time, we were doing shots with Ash, Craig, Jason and Jakes and getting the scoop on other fun spots to visit during our stay. Our favorite bar of the trip was Orphanage Cocktail Emporium on Bree Street, which had fun and interesting concoctions (one of mine came in a plastic bag with a fake goldfish swimming inside!) Our second favorite was probably a tie between Kloof Street House and La Parada, (special shout out to manager Aron for taking good care of us). Mother's Ruin Gin Bar and House of Machines were also good stops along the way. (Really good cocktails in Cape Town will only cost you about $4-$7). Being a bucket list item for both of us, it was important to choose a reputable company for our shark dive. Marine Dynamics certainly fit the bill, with stellar reviews on Trip Advisor and a leading company in conservation efforts for Great Whites. Most times, they offer two trips per day (around $134 with lunch & snacks included), and a small fee for the round trip from Cape Town for an extra $34. (the drive to Gansbaai is about 2 hours each way). This was especially important for a couple of reasons. For starters, we didn't rent a car so we definitely needed a ride, and I've heard of a few people who had to get picked up at 5am... so we appreciated the 10am start time. Despite the later pick-up, that still came a bit early based on our new friends and our desire to, ahem... "experience" the nightlife. That, coupled with a surprise 2-hour "load shedding" (when the country periodically shuts off the power in certain spots), we were a complete mess when the driver arrived with a van full of passengers. (Perhaps that was the reason they insisted that the annoying Americans were the first in the cage). After the 2-hour drive (we slept), we were given lunch and a quick briefing and then set off for the shark infested waters on our boat, Slashfin. In no time, the crew spotted TWO Great Whites, so we stopped and spent the rest of the day there. The cage fits 6-8 people at a time, and I'd estimate each group stayed in the water for a good 30-40 minutes. I was the first in the cage, followed by Dana, and we happened to be at the end where the dude throwing out the chum was standing. Who knew you could scream under water?! Laugh all you want at my shrieks, but you would probably react the same way if those giant teeth were coming at your face. (Also... side note.... why was there a big hole at my end of the cage?!?) In all, our boat saw 14 Great Whites, with the longest being about 15 feet! My one regret was not bringing my large camera to take photos when we were viewing from above, but luckily Marine Dynamics has photographers and videographers on board, and they captured some pretty sweet images. (To see more of them, you can check out their blog post from our trip). It was a memorable experience all around, and one of the top highlights of our time in South Africa. Another highlight was somewhat of an unexpected one. Originally, we had not planned to visit a Township, but as we began really understanding more about the history of South Africa and how much the rippling effects of Apartheid still lingers there, it quickly became a priority for us. (We opted for this over a trip to Robben Island). I chose Laura's Private Township Tours based on her high Trip Advisor rating. She has 42 out of 42 five-star reviews, and it's easy to see why. Laura is one of the warmest, kindest people I have ever met. 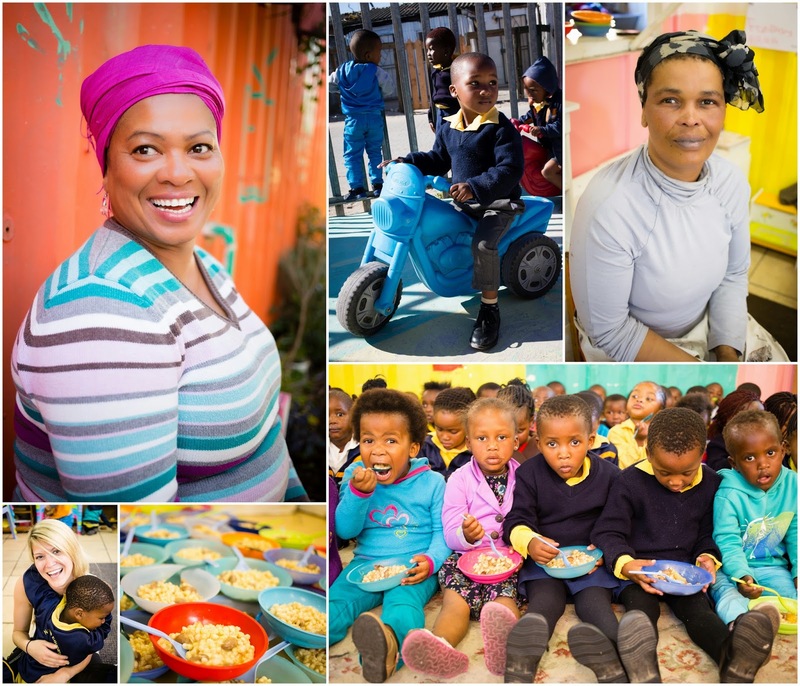 She is originally from Guguletu township, and runs Nondzame Pre-school there for 200 kids, ages 3-6. She has three different tour options, but we chose the "Cooking Tour." It is a little more expensive than the other two, but the extra money is used to buy ingredients for the kids' lunch. We learned that they rarely get meat at school because of the higher cost, but that day, we helped "Lady Gaga" (the school chef) prepare a meal of samp (dried corn kernels made into a porridge) and chicken heart stew. (She also wanted me to inform America that she is the REAL Lady Gaga, haha). Part of the tour also included a stop at the oldest township in Cape Town, Langa, where Laura's father previously lived. We visited a "hostel," where often 3 families will share a single, dormitory-sized room with only one twin bed per family. I fought back tears too many times to count that day, but the smiling faces of those 200 kids is something I will never forget. The hugs, the laughter, and the way they called us "sisi" (or sister) is something that will stay with me forever. How many places can you visit one of the 7 wonders of nature AND one of the top beaches in the world? Cape Town boasts both of those things in Table Mountain and Clifton Beach. Table Mountain is literally in the middle of the city and rises 35-hundred feet in the air with sweeping 360 degree views of Lion's Head, Robben Island, Cape Town and the surrounding area. The iconic South African landmark was also voted one of the "7 New Wonders of Nature." There are several hikes you can take to the top, or if you are pressed for time, a rotating cable car ride for about $18 round trip. Our original plan was to hike up and take the cable car down, but in the end, we opted for the cable car both ways to allow more time for wine tasting (see Part II of my South Africa post). Be warned, however, the strong cape winds can often cause the cable car to close, so be sure to check the website before you go. (Dana didn't tell me until after that she's scared of heights, but she managed to make it through the short but steep ride). According to National Geographic, Cape Town is the 2nd best beach city in the world, with special emphasis on the four Clifton beaches, which are sheltered from those strong cape breezes. Since we visited in winter, we did more of a beach stroll versus a full-on beach day, but I can see why it's a worldwide destination for beachgoers. Leith was as knowledgeable a tour guide as you can get. As we made our way south, we stopped at several lookouts, including Llandudno where I bought a few "curios" (souvenirs) and Chapman's Peak Drive, which boasts stunning views of the cape. We eventually made it to the Cape of Good Hope, where Dana and I participated in the traditional photo op on the "most South-Western point of the African continent." (Technically, the most Southern point is another 150 km away). Unfortunately, there were two giant buses full of tourists there during our visit (had to photoshop an annoying lady out of our picture), so we didn't stay long... but still cool to say we stood where the Atlantic Ocean meets the Indian Ocean. (FYI... there is an entrance fee to the park.... about $10 per person). Note: If you aren't lucky enough to have a private tour guide or a car, there are several companies which offer tours to Cape Point, including a combo wine trip with the same company we used for our wine tour... which is detailed in my Cape Town Food & Wine post. 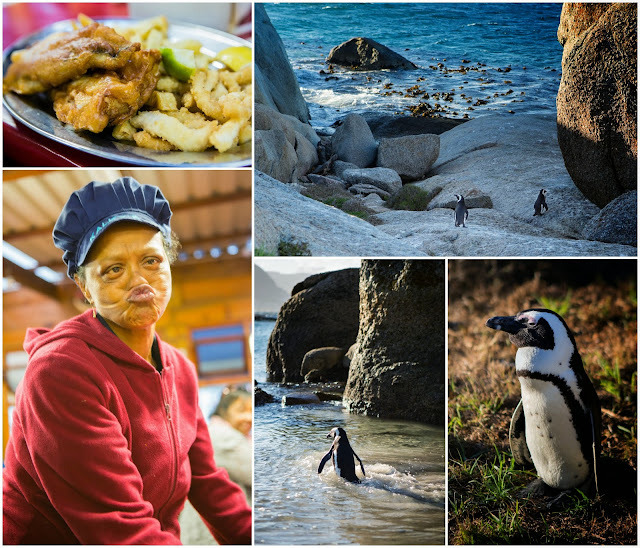 From Cape Point, we continued around the Peninsula to visit the famous Boulders Beach in Simon's Town, which is known for being home to a colony of African Penguins. You can pay an entrance fee to get into that section of the beach, but since it was nearing closing time, we were satisfied to visit the neighboring beaches to the left and right of the main beach for free where some rogue penguins were hanging out. By this time, Rinnet's trail mix had run out and our stomachs were growling (I taught Leith and Rinnet the term "hangry"), so we quickly hurried on to Kalk Bay and the hole-in-the-wall Kalky's, known for its fish and chips. I probably would've eaten anything at this point and thought it was the most awesome thing ever, but I still venture to say this was the best fish and chips I've ever eaten. Dana and I both got the hake and calamari combo and we all silently sat and devoured our food in about 2 minutes flat while "Gadija" entertained us with her funny antics. (I asked to take her photo... she said no, and then proceeded to pose for the camera). Speaking of food... I'm hungry! Click here to continue reading about our adventures in Cape Town, with special emphasis on the food and wine. Click here to read about our amazing safari in Sabi Sands. This is a country that I have never wanted to visit (due mostly to their history of apartheid), but I really enjoyed reading your descriptions. As usual, I am looking forward to the food and wine posts. Your photos are gorgeous! And NO THANK YOU to the sharks. Oh my gosh. I am blown away by your trip!!! What an incredible experience! !